Watch out! New repros have recently entered the market place. 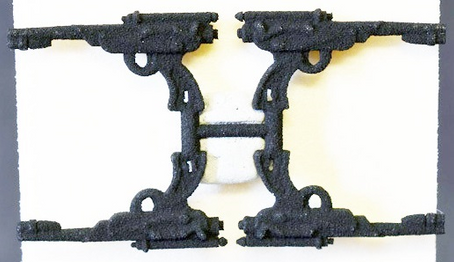 A well-known repro maker has starting selling a range of new reproduction accessories on eBay. These accessories are cast in plastic and have good sculpt details. All of them sink when placed in water. The blasters are available in Blue and Blue/Black. TIG will update the individual sections with more information as we receive it. 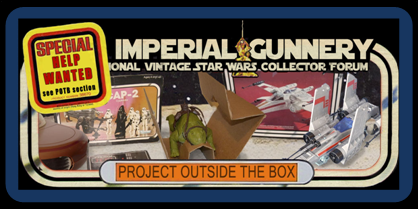 TIG has updated the Princess Leia Blasters section with new information and additional pictures for the V1 to V4 originals. Teebo Battle Horn with letter "B" added to the archive. TIG is pleased to announce that our Identification Guide is now back up and fully running following the last site upgrade in which many of the links and images became broken. 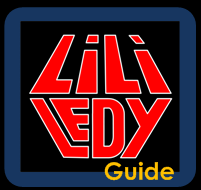 Big thanks to TIG staff member Mat for fixing this excellent and valuable guide for vintage collectors. Following the recent high grade floating reproductions we have been covering, Single Telescoping Lightsabers and Rebel Blasters have now been made available on the market. We will add information on these as soon as we can. 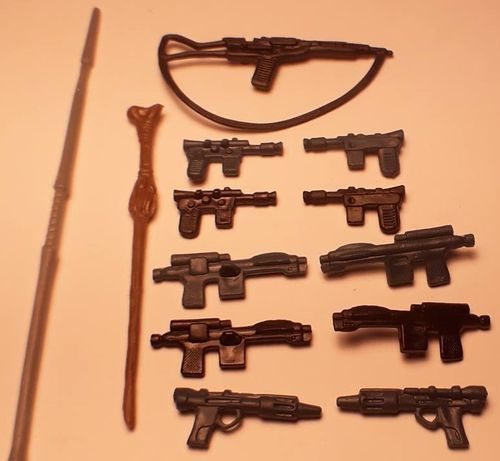 Other updates: Floating Repro V5 Luke Bespin / Jedi Sabers added to Lightsaber section ** Original Luke Bespin V5 Saber reinstated ** Original V2 Imperial Blaster Rough Texture No EPM version added ** Teebo Battle Horn Letter H added ** Leia Endor Helmet Number 2 added ** Repro Palace Blaster V2 image and info updates ** Repro ERG V3 Staff added ** Original ERG V3 Staff added. Visit the individual sections to see. 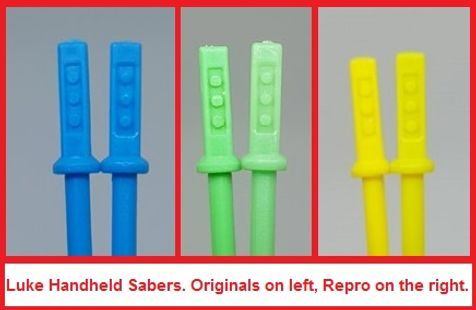 Floating Repro lightsabers - not all of these have the distinctive line at the bottom part of the rectangle that surrounds the three buttons as we previously identified. Some are the same as originals. 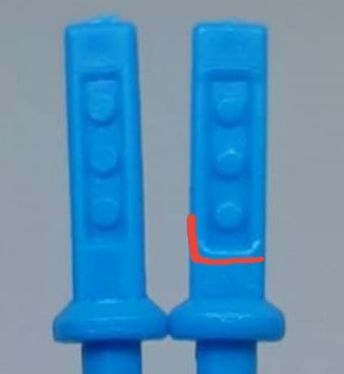 We have identified some additional tells and these are: 1) a slight difference in the angle of the guard as it extends outward from the handle. 2) visible lines running the entire length of the blade. 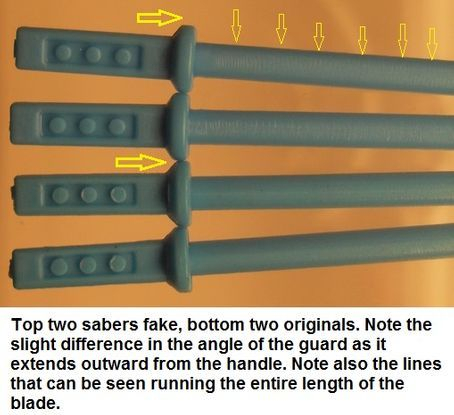 Floating Repro lightsabers hit the market. 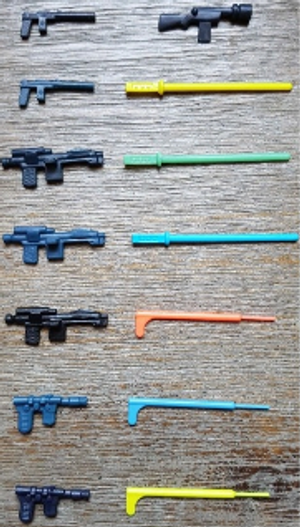 Floating repro Luke handheld sabers in green, yellow and blue have hit the market. The best way to tell these apart from originals is by the line at the bottom part of the rectangle that surrounds the three buttons. We will fully update our lightsaber section soon. Luke Bespin Handheld Yellow Saber V5 Original to be added to the archive. The new wave of near-perfect repros. 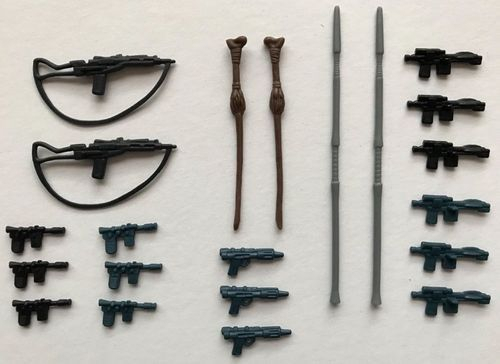 The vintage Star Wars collecting community is seeing a new wave of near-perfect reproductions coming to the market place: the recent floating Princess Leia blasters, the Imperial and Jawa blasters, and currently the Luke yellow, green and blue non-telescoping sabers which we will be featuring on the site later. 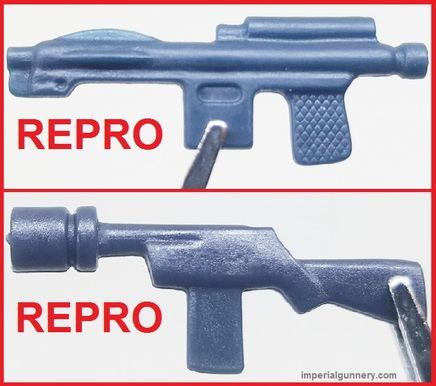 In all likelihood the repro makers have been using our site as a reference to improve their fakes, and we can only appeal to them that in future they create their repros with identification marks. Sadly, it seems the sole intention here is to dupe collectors into believing the fakes are real and to gain a profit. When TIG first began it had two mission briefs: 1) to provide collectors with a resource so they could easily identify accessories. 2) to flag-up known reproductions. Often we are faced with the dilemma of providing detailed photos and accompanying info versus arming the repro makers with virtual blueprints. It's a difficult situation, but we believe we should continue to provide collectors with the knowledge they seek. As the repros become more advanced we must continue to work together as a wide community in spotting, flagging-up and identifying harmful fakes. The cataloguing of the most recent discoveries is a tribute not just to TIG but many sources in the community who have shared their expertise to help collectors avoid being ripped-off. Let's stay vigilant and continue to educate - especially to newer collectors - about the harm that repro does. We are honoured to present Lee Bullock's paper on the infamous float test! Click below to read the article on Imperialgunneryforum.com and help us join in giving Lee a very big round of applause for an amazing look into the science behind the test! 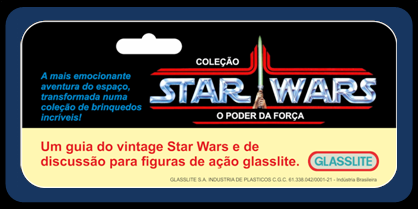 A large number (1000+) of Leia blasters were recently uncovered in the UK. 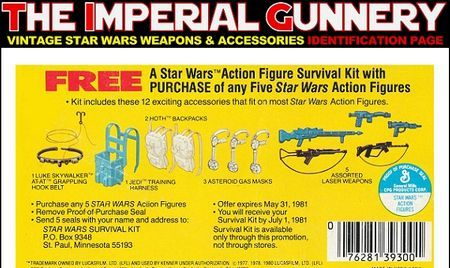 They came with a back story of being found at the Palitoy factory garbage bin by the son of an employee as well as being replacement stock for the 'Kenner really do care' program. A number of collectors have been researching these for many weeks. The explanation of how these pistols were discovered is mainly irrelevant to authenticating them as original. In order for TIG to be comfortable deeming these as original we expected an example to be found sealed in a MOC/baggie or exist previously in collectors hands. 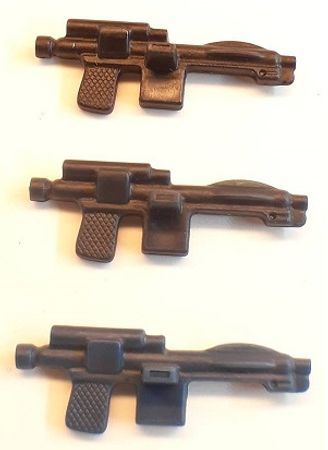 To date, with help from the community we have examined 1000s of loose pistols and 100s of MOCs - NONE have been found with this specific mould/shape. Steve at UKG has also kindly offered his opinion : "It's a fake it is one of the best i've seen and a really well done job but under the microscope and even to the naked eye there are notable differences to it, i've had the verniers on it too and some slight differences around the entire mould." 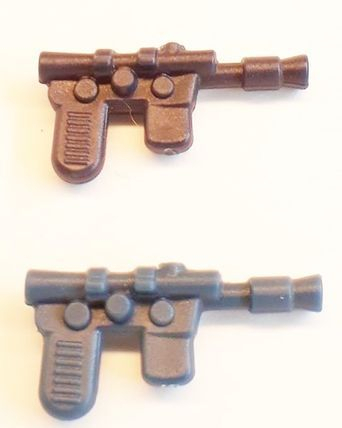 As far as TIG is aware these are the first 3D-printed vintage Star Wars 3.75 accessories to become commercially available. 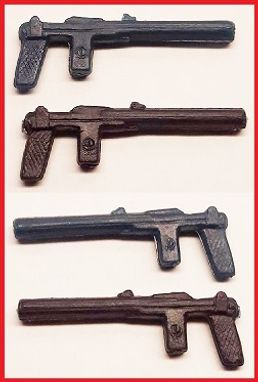 Printed by a well-known studio, these first wave weapons will not be difficult to confuse with originals due to their texture and the identifiable marking of the letter 'R' cut into the plastic. The included photos are taken directly from the manufacturer and have been lightened by TIG to pick out the texture. 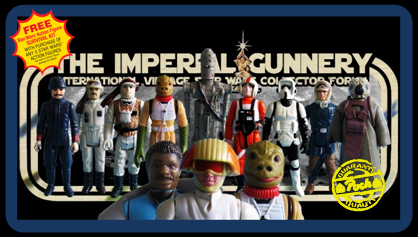 Blasters available so far: Rebel, Imperial, Palace, Bespin, Pilot, Biker Scout, Endor.